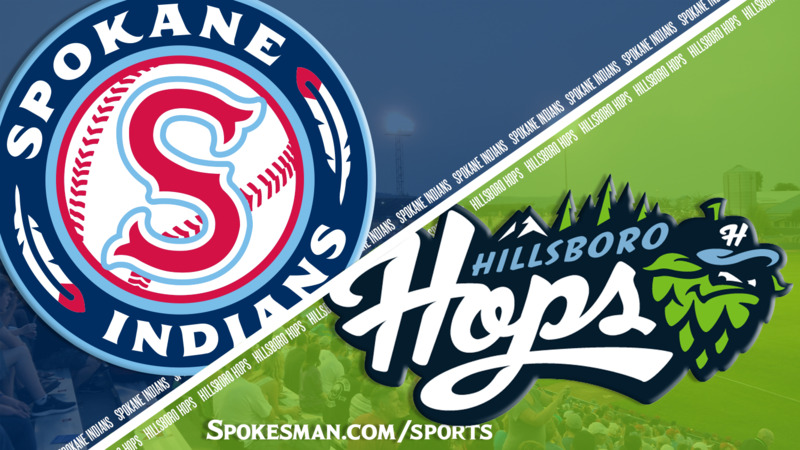 HILLSBORO, Ore. – Curtis Terry hits his league-leading eighth home run of the season but the Hillsboro Hops edged the Spokane Indians 4-3 in the finale of a five-game Northwest League series at Ron Tonkin Field. The Indians (6-13) are 0-8 so far this season on the road. Indians starter Hans Crouse (1-1) struck out seven over 5 1/3 innings, but allowed four runs on four hits – including a home run, one walk, three wild pitches, a passed ball and three stolen bases against. The deciding run for Hillsboro (13-6) came in the sixth: Jorge Perez led off with a line-drive single, stole second, went to third on an infield single and scored on a ground out. Crouse cruised through the first three innings, not allowing a hit or a walk. That ended in the fourth. Tra Holmes led off with a solo home run, his fourth of the season. Perez singled, went to second on a wild pitch, stole third and scored on another wild pitch. Crouse issued a walk to Ryan Tufts and a third wild pitch of the inning sent him to second. A passed ball by catcher Isaias Quiroz allowed the runner to move up to third, and after Crouse picked up another strikeout, Tufts scored on a single by Keshawn Lynch. Lynch stole second base, but Crouse escaped further damage by striking out Zachary Jones to end the inning. The Indians responded in the sixth. Tyler Depreta-Johnson led off with a double and scored on Diosbel Arias’ double to center. Terry then clubbed a two-run shot to tie it up to raise his RBI total to 21, tops in the league. Published: July 3, 2018, 9:56 p.m. Updated: July 3, 2018, 10:05 p.m.